A look at the largest multi-national Big Pharma companies and their posted revenues in 2018. ARTICLE OVERVIEW: We’ve listed the top ten largest pharmaceutical companies in the world and listed their annual growth. Your questions or comments are welcomed at the end. How Do We Measure the Largest Pharmaceutical Companies? In our modern age, we’re extremely lucky that we’ve developed cures for diseases that were previously untreated. But we’re also in an age of Big Business…and pharmaceuticals called “Big Pharma” tend to operate not from altruism, but are motivated by the bottom line. In 2017, the pharmaceutical industry hit its most profitable mark in history at $1.11 trillion. These profits are estimated to rise further in the coming years. This is partly due to the fact that medicines are continuously evolving. Yet, another reason for this large profit has to do with the ever-growing problem with addiction. It’s no coincidence that the Opioid Crisis hit its peak in 2017. Further, the CDC reported that more than 191 million opioid prescriptions were dispensed to American patients in 2017. With around 25% of people prescribed Rx pain killer misusing their opioid prescriptions, there’s a rising demand for these drugs. Not only within pharmaceutical companies but also on the illicit market. The CDC WONDER Report estimates that, on average, 115 Americans die every day from an opioid overdose. The easy answer is that we can look first to profit. Those who make more money must experience a measure of business success. Yet, there are certain cases related to sales growth and offshore competition that broaden the net. A large reason for this is the demand for medications isn’t solely in the U.S. We’re noticing countries within Eastern Asia, Eastern Europe, and South America developing an increasing demand for pharmaceuticals. It’s possible that ROI is higher offshore. It’s also possible that costs are lower. It should be noted that not every company on this list solely manufactures prescriptions which have fueled drug addiction. There are plenty of companies whose sole aim is to find cures for specific diseases and their medications don’t always cause a “high”. As of October 2018, here are the top ten largest pharmaceutical companies in the world. Within recent years, Amgen has found much success in their products and is considered one of the most admired companies in the pharmaceutical industry. Last year, the company profited with $22.85 billion. Located in the United Kingdom, GlaxoSmithKline has been one of the leading pharmaceutical companies for years now. Particularly, due to how it consistently comes up with advanced and original medications. Shingrix – medication to treat the shingles virus. With these approvals, GlaxoSmithKline’s profit is expected to rise from the $24 billion it made in 2017. Though it holds similarity to what it treats in comparison to GlaxoSmithKline, the notable difference is its location in California and, therefore, offering easier access to the American public. In 2017, the companies best-selling drug was Harvonis which is used to treat Hepatitis C. They also found success in their medications Truvada to treat and avert HIV and Epclusa, another drug to treat Hepatitis C.
Through gaining approval of further medications being researched, it’s expected their 2017’s $25.65 billion will increase. With a recent spike in revenue, the American company, AbbVie, has made this top ten list only in the last two years. The reason for their success has to do with their high research-driven work ethic. Test after test, AbbVie has produced a drug expected to treat atopic dermatitis through their product upadacitinib. Currently, AbbVie’s most popular medications are Humira and Imbruvica, both of which are top picks for doctors trying to treat cancer. With that in mind, it comes to no surprise AbbVie made $28.22 billion back in 2017. The main reason they’ve reached this high on the list is due to their pharmaceutical sales staying strong. Medications such as Gleevec have been used for numerous oncology diseases whereas the drug Gilenya has helped with a variety of sclerosis complications. The most notable medication is Cosenty x, a top pick amongst dermatologists, which had an 82% increase in sales according to Novartis’s website. They totaled $33 billion in 2017. The medications of which they’ve had the most success are Keytruda – a cancer immunotherapy – the HPV vaccine Gardasil, and Januvia – a pill for diabetes. Overall, the company earned $35.4 billion in 2017. For a time, Merck’s was the largest pharmaceutical company in the world. Due to their history of success, Johnson & Johnson will be on this list for years to come. However, they may even climb higher considering their sales increased this past year by 8.3%. Leaving them a $36.3 billion company. Aubagio – a pill which treats multiple sclerosis. Lantus – a diabetes insulin injection. Lovenox – an anticoagulant to avert blood clots. 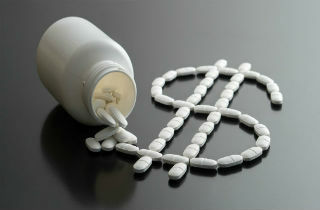 These three medications were not only their best-selling drugs but also gives the company a quarter of its total profit at $36.66 billion. Even more so, the company is looking to submit further researched drugs to help with a variety of diseases such as rheumatoid arthritis and various cancers. Roche totaled in at $44.36 billion in 2017. Overall, Pfizer earned a total of $52.54 billion in 2017. What Pharmaceutical Medications Should You Be Aware Of? Pharmaceuticals are vital for us to understand and treat both physical and mental health. Thanks to the companies above, modern medicine has progressed in a way which seemed unfathomable years ago. Yet, where there’s an upside, there’s also a bad. Not all pharmaceutical medication is safe. In fact, there are many out there was hold high probability for causing a drug addiction. This is when an individual retracts a chronic diseased in which they seek out drugs compulsively and find it difficult to control themselves despite negative consequences. Though not everyone is prone to addiction, it’s important to be aware of the pharmaceutical medications which can cause one. If you or someone you love is prescribed these drugs, it’s vital you only take the dosage the doctor recommends. People who misuse prescriptions often take more than this dosage at more frequent intervals. If you have any further questions pertaining to pharmaceutical companies, we invite you to ask them in the comments section below. If you have any further knowledge on this topic, we’d also love to hear from you. We try to reply to each comment in a prompt and personal manner.